When it comes to buying a new riding lawn mower, choose a size and horsepower that match the size and layout of your lawn and make sure you'll be able to store and maintain the mower properly. Keeping these choices within your budget will ensure that you find a good riding lawn mower. Figure out the size mower for your mowing area. This is not the same as calculating the size of the property to be mowed. Take the overall size of the property and estimate the percentage of open space; this is the total area minus a percentage for trees, brush, unmovable objects and obstructions such as drainpipes, fences and pools. Use smaller mowers and zero-turn radius mowers for tight and small areas; these mowers work well for anything from 1/2 acre to two acres. Large mowers need more room to maneuver. Zero-turn radius mowers can turn while standing still; this is handy for cutting corners and turning around without shifting into reverse. Use larger riding lawn mowers or garden tractors for large, open areas where maneuverability isn't a big concern, but covering large amounts of ground is. Decide how large the blade should be; this will determine how large the mower deck must be for your needs. Small mower decks up to a 32-inch radius can be used for small yards and areas that have limited open space because of obstructions. Use a mowing blade of 32 to 48 inches for lawns of more than one acre. The larger the lawn, the larger the mower deck and blade should be to allow faster completion of the job. Keep the budget in mind when choosing the blade size, because longer blades cost more. Choose the type of mower deck. Mower decks come in plastic, aluminum and steel. The first two choices are cheaper, but the third option is more durable. Examine the lawn; a plastic or aluminum deck can handle smooth, flat surfaces because the chance of damage is minimal. Steel is more suitable for lawns that have roots and rocks, bumps, dips and holes and other changes in ground surface. Decide how much horsepower you need. 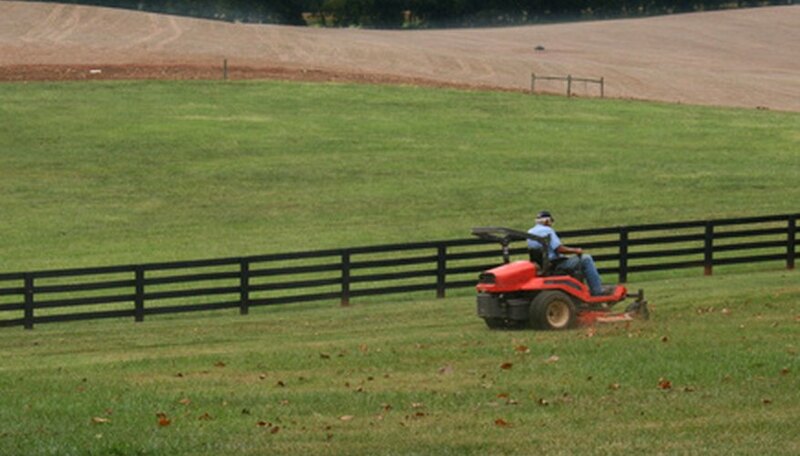 Horsepower equates to the speed of the blade, the blade rotation rate and the speed of the mower. Riding lawn mowers range from 12 to 18 horsepower. Large, open lawns can handle greater horsepower to help you finish the job faster. Small lawns or lawns with many obstructions can use less horsepower because high speeds will be of little use on them. Look at your storage capacity. Riding lawn mowers should be kept under safe cover to keep them in good condition for many years. You may need a small shed or garage, depending on the size of the mower. Measure your storage area to get a good idea of the space. Determine the width and length of the riding lawn mower, then add 3 feet to both numbers to allow you room to walk around the mower while it's in storage. Think about maintenance. Remember that large riding lawn mowers use engines similar to those in automobiles, with filters, hoses, electronic components and drive chains, gears and transmissions. If you are not comfortable performing maintenance on an automobile, you may not like maintaining a large riding mower. Failure to do enough maintenance on it could lead to considerable problems later.